It’s amazing what wonderful things can come from our regular, everyday lives, when we just take the time to look outside of our own routines and pay attention to our community. Starbucks store Manager, Marianne Abaya, does more than just show up for work every day and serve delicious coffee at her location in Whalley. She notices what’s around her, connects with people and invests in her neighbourhood. Out of that one meeting just before Christmas, when Chris introduced himself and inquired about coffee donations, a beautiful connection – a friendship – was born in our neighbourhood, not only between Chris and Marianne, but also between the Starbucks locations in Central Surrey and NightShift. Marianne donated an old demo model coffee maker to the ministry. And she and her partner also came early on Christmas morning to serve Starbucks coffee and breakfast sandwiches to the women waking up in NightShift’s Extreme Weather Response (EWR) shelter. But the new friendship wasn’t just for the holidays. This beautiful community connection has birthed small plans to do great good in the New Year for the homeless and struggling people in our community. Thanks to Marianne and the staff at the 13 Starbucks stores in our neighbourhood, NightShift will be the recipient of hundreds of pairs of new socks collected at the annual Sock Drive, which Marianne began in memory of a beloved customer, Dwayne. He lived on the streets outside her Starbucks store, with all his possessions in a shopping cart. “He was very special to us, and a good friend to all our regular customers,” Marianne remembers fondly, adding that clean, dry socks are among the highest physical needs of people who are homeless. 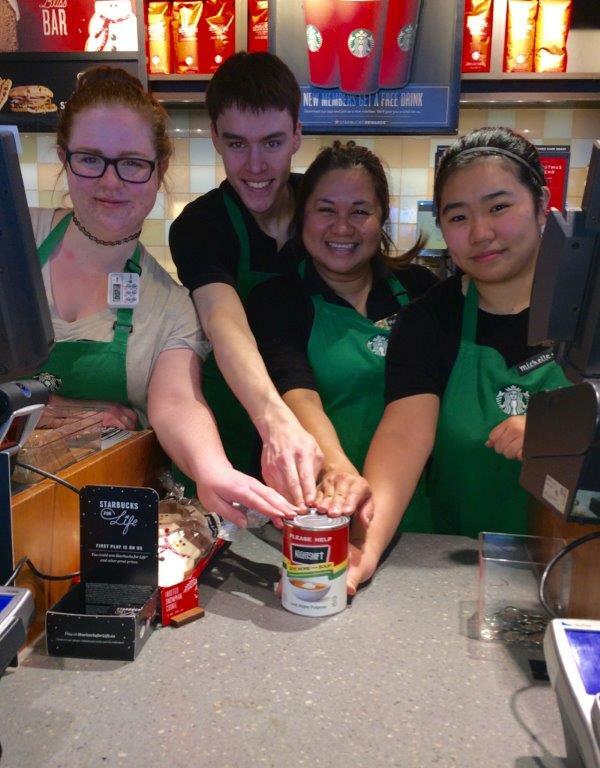 And thanks to the loving hearts of local Starbucks’ staff, our More Than Soup donation cans will be on the counter of all 13 Starbucks stores in the Central Surrey area. The proceeds of all the coins and folded bills collected in the cans go to help NightShift reach out to people on the street through nightly meals and support programs that include basic street level nursing, counselling and the EWR shelter. We couldn’t provide all these services without the help of community minded people like Marianne Abaya. And people like you. You help people stuck in homelessness, addiction and poverty too. Just stop by any Starbucks location in the Central Surrey/Whalley area with a pair of new socks (socks will be collected until January 15); drop some change into one of the More Than Soup cans (or put one in your place of business! ); or make a donation today. There’s still time to have your donation DOUBLED through our Matching Pledge Campaign! Why not ring in the New Year with love, hope and purpose?